Tile #8 allows you to use a worker tile as +2/-2. Tile #11 gives you the ability to place castle, knowledge, or mine tiles with a +1/-1 modifier. This is explained in the rulebook "as though you played a worker tile". 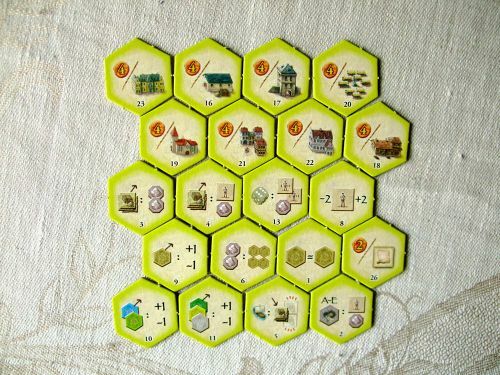 When you use the effect of #11, do you also impart the effect of #8, making it +2/-2 to place one of those tiles, without using an actual worker tile? Nope, they are separate things. So, you get up to +1/-1 for placing that type of building all the time. You could also use a worker to get an additional +2/-2. I did a not-so-ninja edit. Assertion here was that the rulebook says "as though you played a worker tile" for #11. Since #8 was on their board and modifies worker tiles, player wants to know if #11's effect would be automatically adjusted to +2/-2 instead of +1/-1, without the use of an actual worker tile. I've interpreted this the same as the initial reply. It would still only be +/-1 for that type of building. Only the workers give you +/-2 with the other tile. Hope this helps! Yup, I think it is still this way. I think the "as if you played a worker tile" is only meant as a clarification (even though maybe it ended up making it less clear in this case). For example, this tells you that you can use a die showing 6 to place on a 1 space, or a die showing 1 to place on a 6 space. I think a rephrase needs to be restated here...the two knowledge tiles apply to two different things. #8 applies to changing your die number with use of a worker. #11 applies to changing the number needed to place on map/mat. So if number on your map/mat is a 3 for a mine, the 11 knowledge tile make the number needed to place a 2,3, or 4. Tile #8 only allows to modify a worker tile by +/-2, not other tiles like #11. I agree, that the description of tile #11 in the rulebook is a little ambiguos in this case. I guess, the additive 'as though you played a worker tile' is an example to get that issue more clearer in reading the rules for the first time to understand, how theses tiles will work. That was my understanding as well, but I wanted to make sure I wasn't alone in this interpretation. I think you've found a true issue -- to me, the intent is that the effects don't stack. But the words on the page would mean that they do. "As if you played a worker tile," if carried out literally, would modify it the doubled amount. Some games do chain things that way. In this case, I don't think they intended that. Some game rules are meant to be read in the very literal way that would make things like the #11 tile give +2/-2 in this situation. Magic: the Gathering is my go-to example. But given all the awkwardly-translated things in the rulebook for this game, it's pretty clear CoB is not one of those games. Even if the original rules in French or German or whatever were written with that kind of rigour, it clearly didn't survive the translation process. Arguments based on fine nuances of an ultra-literal reading of the English rules are not the way to go here. I'm pretty sure each of these bonuses is only meant to apply to the specific situation it specifically mentions, however an ultra-literal reading of the translated rules might theoretically shake out. "As if you played a worker tile" - the implied and therefore missing text is; ", without actually having played one." The given text instructs you to follow the mechanic or method of using a worker tile when making the modification allowed by tile #11. It does not instruct you, even literally, to actually use a worker tile. You can place a tile "as if you played a worker tile", without actually having played one. I don't agree (though more importantly, it doesn't matter, for reasons given in my previous post - this is kind of an academic discussion ). To me, "as if you had played a worker tile", read absolutely literally, means "with exactly the same effect playing a worker tile would have". Under the circumstances described in the OP, a worker tile would give +/- 2, not +/- 1. Therefore, at least in an ultra-literal game like Magic, the wording involved would mean +/- 2 in this particular situation. Tile #11 modifies the site you are playing to. If a castle requires a 5, you can use either a 5, 4, or 6 if you have knowledge tile 11. The "as if you had played a worker" is an explanatory note, but no workers are actually involved. Right! I think that was the crux for us. The "as if you had played a worker" is a matter of example, and the other tile would only trigger if you had actually played a worker tile. That's how we proceeded, and I think that's how it's meant to be taken. At least, until Stefan joins us to clarify.